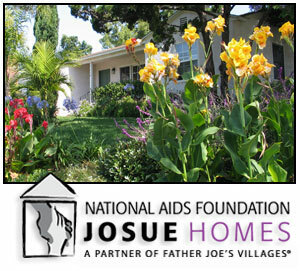 Josue Homes is San Diego County’s first and largest non-hospice care provider for people with HIV/AIDS. Since 1988, Josue Homes has been among the vanguard of service providers for San Diegans who are homeless and HIV-positive. A division of Father Joe’s Villages, Josue Homes provides housing for those with HIV or AIDS who are seeking help getting back on their feet. Josue Homes offers 44 beds in six single-family residences, and provides linkages to a full continuum of community-based supportive services. This includes a broad range of services including access to permanent affordable housing, mental health and substance abuse services, case management, and life and job skills development. Residents stay for up to 18 months while working on a transition plan. They enjoy access to transportation, mail service, recreation and a referral network to outside care providers. The staff helps those with little or no income to locate financial assistance or medical benefits so they can move toward independent living. For those who prefer their own apartments, Josue Homes also provides affordable and permanent housing. Handicapped-accessible apartments are available at Father Joe's Villages' five permanent housing properties. The Josue Homes are spacious, clean and nicely decorated. Residents participate in typical "family" chores such as grocery shopping, cooking, laundry and cleaning—activities that provide a crucial bonding experience for people accustomed to living in isolation. "I came to a place where people were not trying to judge me, but to help me rebuild my life," one resident says of Josue Homes. "I’m very appreciative of this opportunity to have a caring home." “Josue Homes works," another says. "You feel safe and there are always people around who understand what you’re going through. It’s been a real blessing."